Changing the Face of Christianity Inc released the latest results of a Christianity Quiz, scoring how well Christians live the teachings of Jesus Christ. The anonymous self-assessment presents 10 multiple choice questions to determine if you are "Far from Christ", a "Worldly Christian", a "Good Christian", or a "Spiritually Mature Christian". Started in 2011, the Christianity Quiz originally reported that 1 in 4 Christians are Christian in name only. However, the latest results show a sharp increase in the number of Worldly Christians going from 23.7% to 30.9%. Changing the Face of Christianity Inc. now reports that as many as 1 in 3 Christians are Christian in name only. This means that 1 in 3 self-proclaimed Christians admit they don’t live the teachings of Jesus Christ. Changing the Face of Christianity Inc, a 501(c)3 non-profit, is working to improve this situation through a convicting educational message aimed at Christians and a Christian maturity and transformation strategy. The latest results show a sharp increase in the number of Worldly Christians going from 23.7% to 30.9%. Changing the Face of Christianity Inc. now reports that as many as 1 in 3 Christians are Christian in name only. Changing the Face of Christianity Inc has released the results of a Christianity Quiz; an anonymous self-assessment scoring how well Christians live the teachings of Jesus Christ. E.g. The quiz answers the question: "How Christian Are You?" Answer 10 multiple-choice questions and the quiz returns a score, indicating how well the person lives up to the Christian ideal as modeled by Jesus Christ. The results indicate if you are "Far from Christ", a "Worldly Christian", a "Good Christian", or a "Spiritually Mature Christian". R. Brad White, the founder of Changing the Face of Christianity Inc, a 501(c)3 non-profit, says "The results are disturbing, as 1 in 3 self-proclaimed Christians admit they rarely live the teachings of Jesus Christ. Our mission is to reverse negative Christian stereotypes by helping Christians become more like Jesus Christ. And so, our goal is to work with local churches and to help transform these unChristians into spiritually mature Christians who walk the walk, and better represent our faith to the world." The quiz results show 27.8% of Christians are spiritually mature; a decrease of 5% since the prior year. R. Brad White says, "A little over 1/4 of Christians consistently live their faith. These are spiritually mature Christians, having experienced Christian transformation, that represent Jesus Christ well through their words and actions. These Christians engage with the world in a positive and loving way and truly bring Glory to God." 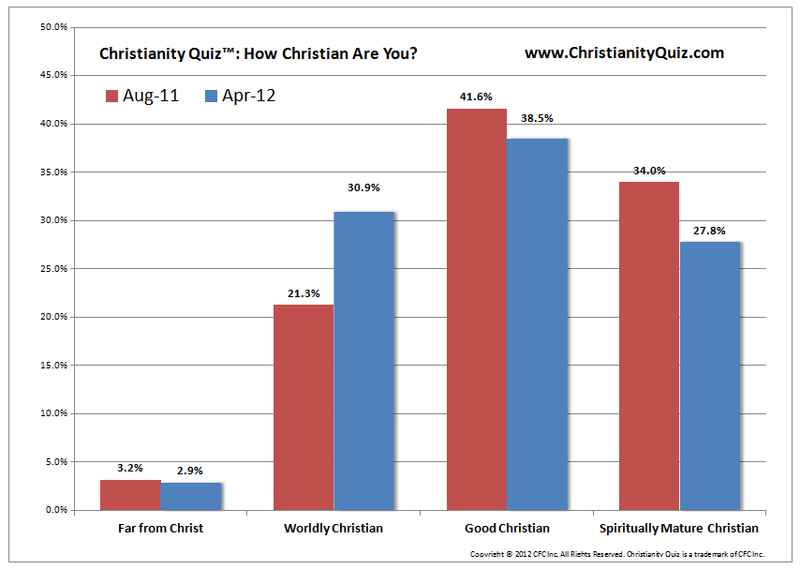 The quiz results show 38.5% of Christians are "Good" Christians; a decrease of 0.5% since the prior year. R. Brad White says, "A significant majority of Christians consistently live their faith. In addition to the 27.8% of spiritually mature Christians out there, 38.5% of Christians take their faith seriously and are striving daily to live as good Christians. Yes, we are still human. We stumble. We fail. We make mistakes. We screw up. These Christians aren't perfect, but are striving to consistently practice their faith. These Christians are at the tipping point and very close to becoming spiritually mature. This is incredibly promising to us. But there is also a risk that many of them will go the other way. Our organization seeks to help move these folks into spiritual maturity through our Bible study on negative Christian stereotypes and other programs. The quiz results show 30.9% of Christians are worldly; an increase of 7.2% since the prior year. R. Brad White says, "This means they are mostly Christian in name only. When posed with a real world situation which tests their faith, they tend to do what the rest of the world does, instead of living as Jesus instructs. To be clear, these aren't "bad" people. The score results suggest they think much more about themselves, than they think about God and other people. Reading the Bible and praying aren't a common practice. These are people that you would probably be surprised to find are Christian, if it weren't for the cross around their neck. These people are in the sweet spot of where we need to do our work. We are here to walk along side them, love them, educate them, mentor them, and guide them into living their faith through their words and actions. Christians in this category are increasing. There seems to be a downward shift among spritually mature Christians, as well as a decrease in the number of Christians who are far from Christ. So the increase in worldly Christians is both good and bad." The quiz results show 2.9% of Christians are far from Christ; a decrease of 1.7% since the prior year. R. Brad White says, "About 3% of self-proclaimed Christians aren't even trying to live as Christians. And these aren't just brand new Christians who don't know better. These are people who are often born into the faith who have never made a conscious, personal decision to be a disciple of Jesus Christ. They may call themselves Christian, but they are far from it. They likely aren't part of a Christian community and don't seek the accountability and growth that a Christian community offers. Or, they are just going through the motions. In their hearts , they are not in a relationship with God; the creator of the universe; Jesus Christ. Our challenge is finding these folks, connecting with them, and helping them get into the game. One bright light is that there are less 'far from Christ' Christians today when compared to last year." The Christianity Quiz is available at http://www.ChristianityQuiz.com. "We pray that God uses our Christianity Quiz as a catalyst and motivator of positive change and growth within our Christian faith. ", says R. Brad White. To help fund our programs and ongoing research, we accept and appreciate Online Donations. For over half of his life, Brad was an unshakable Atheist. But after a miraculous sign from God in 2005, he shed his blind disbelief and became a believer. Brad felt called to start “Changing the Face of Christianity” in 2010′. Brad is available for interviews, radio segments, opinion pieces, guest blog articles, and commentary on our Christian faith and culture. Changing the Face of Christianity, Inc.